A new BBC documentary has raised awareness and prompted new questions about the scale and extent of Britain’s use of state agents to kill innocent civilians in Ireland. The Panorama documentary examined how the British Crown forces hired thousands of agents and informers to work inside loyalist paramilitary groups and the IRA. Their actions caused the deaths of “hundreds and hundreds” of people, according to the North’s former Police Ombudsman Nuala O’Loan. She told the programme: “There was impunity really for these people to go on committing their crimes. Many of them were killers, some were serial killers”. The program shed light on some of the worse cover-ups of the conflict, such as the Sean Graham massacre of five Catholic at a bookmakers on the Ormeau Road in 1992 and the assassination of Sunday World journalist Martin O’Hagan in 2001. It presented strong evidence that state agents involved in these and other attacks were allowed to kill with impunity -- and that weapons were often provided directly to the killers. In regard to the O’Hagan murder, an RUC/PSNI Special Branch officer is currently being investigated for perverting the course of justice and Mr O’Hagan’s brother Fintan told Panorama he believes the case collapsed because of collusion. “They have psychopaths in their employ and are feeding them back into society to do... their dirty work,” he said. 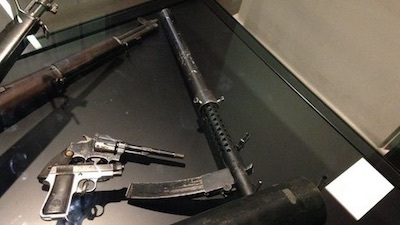 It also revealed an assault rifle used in the Sean Graham massacre, which the PSNI had claimed was disposed of, ended up prominently display in the Imperial War Museum in London. The gun was part of a large consignment imported in the late 1980s by the British Army’s Force Research Unit (FRU) agent Brian Nelson, and has been linked to several attacks during the conflict. Relatives of Justice said the museum discovery was “beyond being crass and insensitive - it’s downright sick and adds insult to injury in what is already a grave injustice yet to be addressed”. Among the other allegations were that one of the men involved in a notorious sectarian massacre at Kingsmill in 1976 was in fact a British agent; and that even members of the RUC died in Newry in 1992 as a result of efforts to advance informers within the IRA. Panorama said it had uncovered “extraordinary evidence” to show how the victims were killed and their killers protected, with the Crown forces going to considerable lengths to conceal information. In the case of the murder of Martin O’Hagan, it was only after the current Police Ombudsman Michael Maguire, threatened to take the police to court did the PSNI release files relating to the killing. His investigation into Mr O’Hagan’s death has been ongoing for eight years. Defending the system of state agents and informers, PSNI Chief George Hamilton claimed “hundreds, if not thousands” of lives had been saved through their actions, but that standards had since improved. “There were no rules”, he said. However, Sinn Fein’s Gerry Kelly said that the PSNI could still authorise informers and agents to carry out crimes and that it is “patently untrue” to claim otherwise. “A senior ranking officer in the PSNI actually has the power to clear informants to carry out criminal acts,” he said. He described the Panorama programme as the latest contribution in “a wide body of evidence of systemic British state collusion” in a murder campaign against the nationalist community. He said there was a need to speed up the talks process to “deliver the architecture to deal with the legacy of the past”. The Pat Finucane Centre, a human rights lobbying organisation, also called for plans for the establishment of a Historical Investigations Unit (HIU) to be implemented. “Last night’s programme was the final proof that the PSNI cannot be trusted in ‘ historical’ investigations,” it said. Amnesty International’s Patrick Corrigan described the allegations as “truly disturbing”. “Killing people targeted by the state, using intelligence provided by the state and shooting them with guns provided by the state -- if all this is proven, we’re not talking about a security policy, we’re talking about a murder policy. “There must now be a full, independent investigation into the scale of the policy where the police, army and MI5 worked with illegal paramilitary groups, resulting in the deaths of perhaps hundreds of people.